Gorgeous! You look lovely Lilli! Many kisses! Have a great week!!! Ciao Lilli. Mi piace un sacco la tua borsa e trovo molto carini anche i sandali. Ciao Lilli, anche io ho una gonna nera lunga ed amo creare ogni volta abbinamenti diversi.Il tuo mi piace molto e prenderò spunto!! You know Lilli, on most people this combo probably would not be as flattering, but you have such a tiny waist, you can totally pull it off. The long grey tee worn over a black maxi looks so effortless and totally perfect on you!!! This outfit is really superb in its minimalist. I really like the accessories as well. Those sandals are very chic and the orange bag is the perfect pop of colour....another thing I really like is that L necklace! how lovely! The sunglasses are very cute...and so are the earrings....nice lipstick to match this styling. ...adoro l'arancio con la bella stagione...bella la borsa abbinata allo smalto!!! Mi piace molto la gonna e il colore della borsa lo trovo splendido! 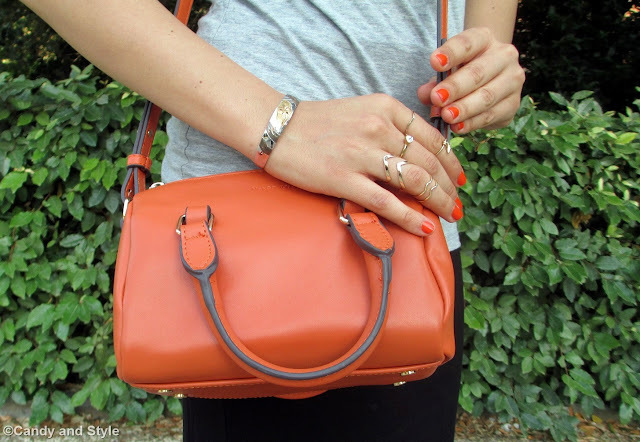 Che bel look, semplice ma super glamour con quel tocco orange! Siiii, sone deliziose quelle ciabattine! Un outfit perfetto seppur minimal, curatissimo in ogni dettaglio: dalla manicure, al lipstick, richiamati dall'arancio della deliziosa borsetta!!! I love the pop of orange in such a neutral look and you look divine my doll!! Effortless | Neutrals With A Dash Of Orange - Hi babe! I have to say that I love the mix of colours in this outfit - the long grey tee worn over a black maxi, the chic sandals, the cute accessories and the surprising pop of orange of the cool bag looks so effortless and totally perfect. Lovely! Friday Loves – as ususal you’ve totallly nailed it for summer with your great choices- love that bikini! Summer Look Straw+Denim+Maxi+Wedge - to say the least I’m dying over this whole superb look! I really love this mixo f magenta and hot pink colour just now and it looks amazing on you! It's so rich and vibrant, perfect for a sunny day and a great mood setter! On point, babe! Summer Nails TNS Cosmetics Accent Manicure Capsule Collection - These colors look absolutely beautiful and so summer ready Lilli - great choice of vibrant colours for a perfect mani/ pedi! Leopard Fancy – way to go, girl, rocking the wild thing! ;)the mix of leopard prints and graphic tees in this combination is so cool. You look very chic and the jewelry pieces greatly enhance the outfit. So beautiful! Trend Alert: Lace-up Suede Wedge Sandals Yes or Not? - Wedge sandals are my go-to during summer but not so much for lace up. Nevertheless theTopshop version is also a great versiom the Chloe’s. great saving! Wearing orange golden are the best accessories. In weekend I took out all my summer shoes, I have a similar pair very comfy. Beautiful and elegant!!! I love your bag!!! Dear Lilli, the shirt together the maxi skirt looks very pretty for you with your perfect body. And the flats complied this nice summer outfit. Orange is the sister of red and a great color for a bag. I love Brighton colors for bags. A wonderful accessories for neutral colors. Un genere di look che piace un sacco anche a me Lilli, adoro la gonna lunga nera e semplice, soprattutto se indossata con un accessorio colorato come quel bauletto! Bella bella! A t-shirt over a maxi skirt is brilliant, never thought maxi skirt would look great with a t-shirt. Hmm, definitely something for me to try. I love sliders! It's the most comfortable thing to wear and it's very chic! That black and grey looks great together Lilli. Love your patent slides. Fabulous pop of orange indeed. Your orange crossbody adds the perfect pop of color to this chic neutral outfit and I love your coordinating orange nails as well. 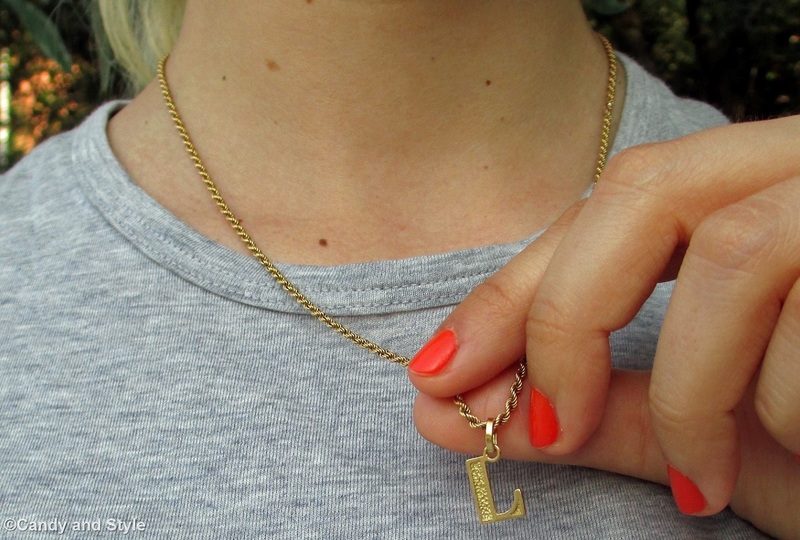 The slides and your L necklace are very cute too. Have a wonderful week dear friend! Mi sono in amorata delle ciabattine Lillie poi che bella la mi i bag arancio. Adoro questo look Lilli, sei sempre bellissima! Un bacio. Truly effortless chic Lilli! Nothing beats a t-shirt and a skirt with slides. Nice orange bag. I am trying to add some red and orange in my wardrobe too. I love how casual your outfit is especially with the pop of color you added to this outfit! mi piace tanto questa gonna lunga nera e portata con i sandali bassi è un amore! This is such a lovely skirt Lilli! I love the pop of color that you added with the bag! I think the normcore is not a style that fits well at all, but you take great combination is a simple but trendy at the same time, kisses Lilli! Hi! I hope you are well! I've been enjoying folowing along here and on Instagram too now. I have said this before that I'm a huge fan of neutrals and a pop of colour is always a good idea. I love the orange for summer and coral or orange is one of my favourite shades of nail polish at the moment too. Lovely outfit choice! Enjoy the rest of the week. Nice and comfortable outfit and really love the idea of adding a splash of orange! Love this look Lilli, I'm imagining you're about to hit the flower markets or brunch by the sea. I love the slides on you. I too am loving the trend.